Science teacher education has long sought to educate new science teachers to more fully understand “Science-for-all” and prepare them to effectively navigate diverse contexts. To adopt this “Science-for-all” mantra, we need to address what the labeling (i.e., categorical labeling and/or mislabeling) of students with disabilities means for science teacher education. 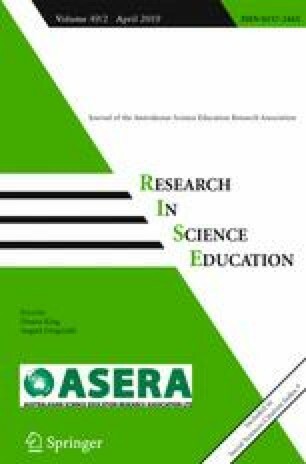 This paper provides a critical inquiry to ground the claim that disability operates subversively and unrecognized as a marker of difference similar to labels that produce exclusion in science education (e.g., race, class, and gender). Using a phenomenographic design, this research studied graduate students’ conceptualizations of disability as they progressed through the only required diversity course at a large, urban university in the American northeast. Primary data sources included in-depth, pre-/post-course interviews with supplemental data collected from biweekly course reflections. Phenomenographic data analyses addressed to what extent these graduate students embraced a disability studies perspective relative to disability—i.e., viewing disability beyond merely individual deficit. Findings suggest that the course sustained the relatively static conceptualizations about disability held by the participants related to individual deficiency rather than pushing for more critical views of disability beyond deficiency. Implications are discussed in relation to multicultural science teacher education course goals. I would like to thank my dissertation sponsor, Dr. O. Roger Anderson, as well as my second reader, Dr. Felicia Moore Mensah, for their constant critique and support of my work at disciplinary and conceptual intersections not yet taken up fully in science education research. I would talk with whoever the school specialist is because if it’s not just a disorganized thing, if she is, in fact, thrown off behaviorally even by slight changes in my lesson, I would say that’s not a pedagogical thing to deal with and I would want to make sure that someone has actually addressed her, like, ‘what’s going on’. See if anyone has any ideas of what’s that about. I would probably go to guidance first. I would probably go to her counselor and find out if there’s some additional information I should know about her and potentially if there were additional information I should know or concerns I have about her behavior being abnormal classroom behavior, I might ask a special education person. But I would go to her counselor first to see if maybe I missed some documentation somewhere along the way. I have had students in my class that do those types of things and most of the time I have simply tried to go on with the routine. Well it depends, if the person has Tourette’s and those are parts of the ticks that you have to deal with, and unless it is truly disruptive, I would just go about my lesson and try not call attention to it and hope other students do not call attention to it. If, in fact, it’s outbursts of screaming that do not seem like ticks but more like major eruptions then I would probably again, ask for additional support to find out what specifically that student I need to know if I do not. I am assuming I would already know enough information about my students to know where the source of that is coming from because if it is a simple issue of ticks and a medical diagnosis then I would do whatever is appropriate for that student. If it’s actually outbursts that are behavioral and not related to something that is an ‘outbursty’ disorder, then I would address it with the counselor. I would first of all try and get more specific information about what challenges she has to overcome whether it is mostly organizational, kind of executive challenges with keeping her on track. If, in fact, it’s primarily those challenges to kind of organizing her day, organizing her files, organizing her notes, then I would try and work specifically on strategies to, you know, keep her notebook, keep her assignments, things like that on track in class and I would probably check in with her kind of throughout the class in subtle ways but check in with her ‘did you get, did you write that down, did you get your, did you put your worksheet in your backpack, did you write in your homework book that you, that you have this to do tonight’. That kind of stuff and see if those more minor interventions are effective first and then kind of go from there. If she needs more one-on-one kind of time, more direction, I would kind of gradually set it up until I have scaffolded it to a level where she’s more functional in class. You observe other students mocking Gus’s uncontrollable behaviors, especially during group work that consistently causes students within the group and outside Gus’s group to get off task. Whenever I see kids being disruptive or mocking other kids I do not address it as a group. I might, the first time, walk over to the group and say ‘you know, listen, you are off task, this is what you need to do’ but if it is a persistent behavior, if they are actually making fun of him, my personal strategy in terms of classroom management is to pull kids aside individually from the class because I find that they are much more uncomfortable having to address that behavior one-on-one with me then when they are in a group being silly. If I see kids giving other kids a hard time I will pull them aside first individually and methodically and if they, and typically that’s as far as it goes because once they get called out on an individual level, that’s like really uncomfortable as an adolescent, that typically takes care of it, but if I had to go beyond that then, in every school there’s kind of procedures for next steps if a kid is actually harassing another kid, you are going to have procedures you need to follow but most of the time you can kind of nip it in the bud in class by calling their attention to the fact that you are watching and know what’s going on in a subtle way. And if they do not take to subtly very well, which sometimes adolescents do not, I pull them aside one-on-one and tend to target who the group leader is first and see if that does not settle thing down and then if need be go to the other individuals involved. But, I would not make it an issue of the kid that’s got the issue. Right? Because clearly, no adolescent, unless they have a real behavioral or medical issue wants to call that much attention to themselves in a negative way. First thing I would do is pull her aside and speak to her privately and figure out if there’s something going on either with me or with some other student in the class. If that does not work, I would get her guidance counselor involved and the guidance counselor would take it to the next level, probably counsel her a little bit, and then I would probably call her parents, call her house to see if anything is going on at home. If all that does not work, we’d probably have the parents come in, myself, the guidance counselor, and maybe the assistant principal and we would have a meeting to try to figure out what the issues are. If she’s not a special education student, then that might be one of the issues that maybe she does need to be evaluated. And that’s an official process but as time goes by you realize that that is the logical way to do it. The first thing I would do is talk to the student privately and figure out what the issues are. If it’s uncontrollable behavior, in terms of disrupting the class, I would also let the student know that if they do it again and they disrupt and stop the class, then I would have to get the dean’s involved because they are preventing their peers from getting an education. If that does not work and disciplinary action does not work, then we would again get the guidance counselors and the parents involved. That’s what we do. Number one, if she’s labeled emotionally unstable she would probably either be put in a self-contained special education class or an inclusive class, which is a class that has a general education teacher and a special education teacher, like a co-teaching class. The co-teacher and I (the special education teacher and I) would try to formulate a plan for her and differentiate the lessons based on that. So whatever lessons we are teaching that day the special education person would just kind of manipulate everything to make sure that we can get it to her, you know. In terms of the behavior, I would say that if they have diagnosed her and we know what her IEP says, then we would probably try to formulate some method of calming her down or figuring out some way to help her transition properly because she probably not going to respond like a normal student would. If it is kids that are in his group I would re-assign him. When, in a situation like that, I think the teacher has to be hyperaware of the social interactions of every student in the classroom. And one of the things is that when we do grouping, you know, it’s very purposeful. I would pick, in Gus’s situation, I would pick the best performing student, the most well-behaved student to be his group member, to be his partner. Maybe I would break the groups down from 4 into just 2, you know, because sometimes I group of 4 does not work. In fact, a lot of times a group of 4 does not work, they just get off task. So I would pick the student in the room that’s most well-behaved, and there’s always, you know, at least one kid that is most well-behaved, and I would partner Gus with that particular student. Because the most well-behaved student is probably going to encourage him the most, give him the most praise, and help him the most. And when the other kids in the room see that, they are going to back off. They will, from experience, that’s usually what happens, not all the time. World Health Organization. (2011). World report on disability. Retrieved from: http://library.bsl .org.au/jspui/handle/1/2587.